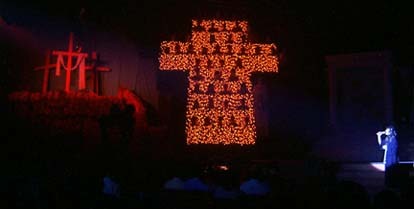 The MidiLite has numerous other applications including Easter Productions such as the Living Cross. Living Cross production each year. Their 1999 production debuted a new 9 tier structure with full MidiLite lighting effects. Click here to see more about the Hyland Heights Living Cross. Thinking about doing a Living Cross presentation like this? Here are some drawings of how Hyland Heights Baptist Church approached it.